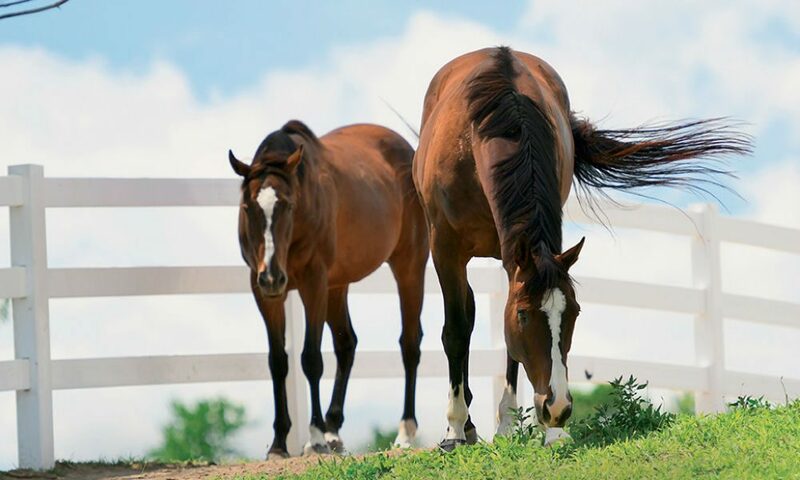 East Greenbush barn has found greener pastures for 1,500 ex-racehorses. It’s a sweltering June day. At high noon, the heat is rising. But inside the ReRun barn in East Greenbush, more than two dozen horses are comfortable in their stalls; cooling breezes spin from whirring fans. Lisa Molloy, executive director of ReRun, strides briskly through the tidy, state-of-the art barn and stops at a stall. Most Happy Fella, a retired racehorse, thrusts his head forward to greet her, and Molloy plants a quick kiss on his muzzle. For Happy and other New York racing favorites like Saratoga Snacks, Metaurus and 2008 Turf Horse of the Year Dave, ReRun is their permanent home. But most horses at ReRun, a nonprofit thoroughbred adoption program, will go to other new homes. 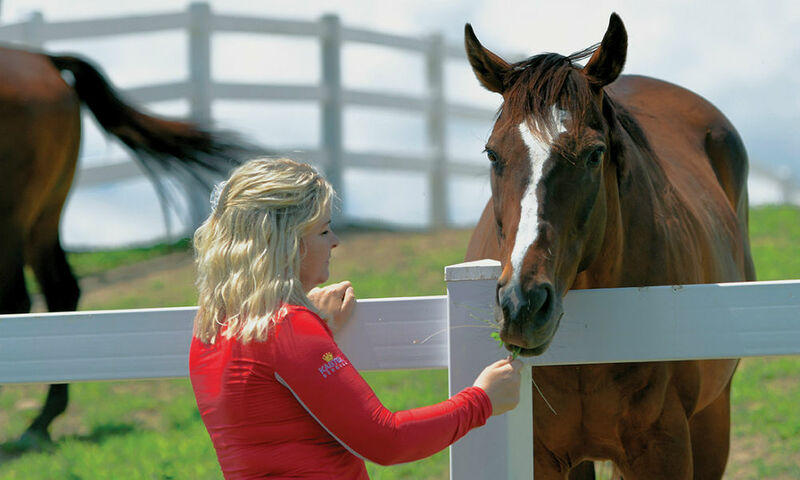 For 21 years, it’s been ReRun’s mission to rehabilitate, retrain and find adopted homes for retired racehorses. It’s one of the oldest thoroughbred retirement programs in the country and the largest in New York State. “It was originally started in Kentucky as part of the Kentucky Humane Society,” says Molloy. For several years, ReRun had farms in Virginia and the Finger Lakes. Two years ago, ReRun consolidated its operations and moved to 21 acres in New York’s Rensselaer County. The facility, which includes a 48-stall barn, two tack rooms and a 200-foot-by-100-foot arena, is hidden from view on a hilly road and surrounded by fields crisscrossed with white fencing. ReRun has found homes for more than 1,500 thoroughbreds. “Up until 2004, they adopted out 450,” says Molloy. In the past four years, since Molloy came on board in 2013, about 400 have been adopted. “The last two years were the most successful years in the history of the organization,” says Molloy, an Englishwoman who has impressive credentials for thoroughbred care and training on both sides of the Atlantic. Last year, ReRun took in 125 horses ending their careers on tracks in the Northeast and the mid-Atlantic, including Saratoga Race Course. “We take horses from a lot of local thoroughbred trainers, like Nick Zito and Jimmy Bond,” Molloy says. Glenn DiSanto of Greenwich, a trainer and breeder who passed away in January, also handed over horses to ReRun. “I just took his last horse,” she says. Horses that come to ReRun must be registered thoroughbreds. Some have not raced. People who hope to adopt a horse go to ReRun’s website, where each available horse appears in a video. This summer, you’ll see Vital Point, “an adorable little girl with no vices,” and Lotza Heat, a 6-year-old gelding that ran 23 times and won about $70,000. The adoption fee for these animals is $500. Retiring horses arrive at ReRun year-round. There are usually 30 to 35 in the stalls, including the four that Molloy herself has adopted. ReRun is Molloy’s home, too. She lives in an apartment above the barn with her 12-year-old son, Jack. Her husband, Tom, a Bronx native and Army veteran who served in Operation Desert Storm, works for a military contractor and often travels overseas. Lisa and one former DiSanto employee are full-time, and three other employees work part-time. Molloy and Amy LeBarron, a Saratoga Springs trainer, do all the retraining. Because ReRun is not a rescue program, it does not use volunteers. ReRun is supported with grants, private donations and fund-raising events. “Moneighs,” artworks created by famous racehorses that use their mouths, whiskers, hooves and tails to brush the paint, are sold at auction events. Saratoga Snacks and Most Happy Fella are among the newest four-legged artists. There are also sponsorships, a donation that helps pay for the care of a specific horse. For $20, you can sponsor 14-year-old Dave or maybe Stan, a horse that was frail and infested with parasites when he arrived from Kentucky. Jeffrey Cannizzo, executive director of New York Thoroughbred Breeders Inc., is an enthusiastic ReRun supporter. “It is our responsibility as owners, tracks, breeders, trainers, jockeys, bloodstock agents, and anyone who has a stake in the game to take responsibility for the aftercare of the horses that make up our great sport,” Cannizzo says. Molloy grew up in Grimsby, a seaport in Lincolnshire, in a family of deep-sea fishermen. “When I was little, my granddad used to walk me down to the fish docks and he would pick me up fresh smoked haddock for my tea. On the way back, there would be people on the beach giving donkey rides. I used to ride the donkeys,” she says. Her granddad also bet on horse races, and often asked Lisa to pick a winner from the lineup in the newspaper. Lisa fell in love with horses, and by the time she was 4, her family was driving her to riding lessons on weekends. In the ReRun office, colorful prize ribbons from horse jumping and gymkhana games hang in a row along a wall. “These are my ribbons from when I was a child,” she says. As she got older, she worked in the barn to pay for her lessons and kept riding during her student days at the Bishop Burton College of Agriculture. In England, Molloy worked for famous Irish-born trainer Jimmy Fitzgerald and with British Champion Jockey Kieren Fallon. In the United States, she worked for Bob Perry Quarter Horses in Texas and other farms in New Jersey, Mississippi, Colorado, Kentucky, Virginia and New York. Before coming to ReRun, she was facilities manager for New Vocations Racehorse Adoption Program in Kentucky. With 10 years of experience in adoption, Molloy has a keen eye for who should and should not take home a racehorse. “The horse has to have a safe place to go to, a safe responsible home,” she says. And with social media, Molloy can follow a horse and see how it’s doing years after it leaves her barn. As with most nonprofits, her biggest challenge is money. Helping a racehorse begin a new life is easier because Molloy’s own life has always been about her love for horses. “I can find them homes. Even the most difficult ones, eventually. It’s almost like dating, like Match.com. There’s somebody for everybody.